by John Gerard Ruggie. New York: W.W. Norton and Company, 2013. 251pp. Hardcover. $24.95. ISBN: 978-0-393-06288-5. Certain years in the annals of human history grab our attention simply because they are more momentous than others. The extraordinary events they contain call into question well-worn assumptions and unhinge established paradigms. 1989 was one of those years. The death of Ayatollah Khomeini in Iran; the occupation of Tiananmen Square in China; revolutions sweeping across Poland, Hungary, and Czechoslovakia; the fall of the Berlin Wall; the beginning of the last chapter in the rather short but consequential history the Soviet Union. Of course, 1989 will also be remembered as the tipping point for the undoing of the most basic organizing principle in international affairs in the Post-World War II era – the Cold War. That summer, the brilliant young scholar Francis Fukuyama penned an article for THE NATIONAL INTEREST called “The End of History” that captured the zeitgeist by making a claim as bold as the changes afoot were breathtaking. “What we may be witnessing,” stated Fukuyama, “is not just the end of the Cold War, or the passing of a particular period of postwar history, but the end of history as such: that is, the end point of mankind's ideological evolution and the universalization of Western liberal democracy as the final form of human government"(p.16). For Fukuyama, the century-old experiment fastening totalitarian governments to command economies had come to an end; only one set of ideas was left standing. Madison, Jefferson, Hamilton and Adam Smith had won out over Marx, Lenin and Mao. A quarter century and hundreds of articles probing Fukuyama’s thesis later, it is clear that history has not come to an “end.” Whether the formula of western-style representative government combined with a neo-liberal agenda of opening markets and privatizing resources has won or should win the hearts and minds of 7 billion souls on the planet remains up for debate. What is not in dispute, however, is that the end of the Cold War coincided with – and perhaps triggered – the onset of the greatest wave of corporate globalization in human history. On January 1, 1990, TIME Magazine named Mikhail Gorbachev as its Person of the 1980s for the changes he wrought in the world order. One could argue that the “person” of the 1990s was the multinational firm. Through technological advances, the changing international political landscape, and with the headwinds of neoliberalism at their backs, multinationals were able to strategize and integrate a global vision that transcended national economies while thwarting state actors’ attempts to exert territorial sovereignty. This transformation has been one of the vital [*464] organizing principles internationally at “the end of history.” Some of its features actually harken us back to the days of unfettered American capitalism during the Gilded Age: the creation of enormous amounts of wealth built on shocking swaths of poverty and despicable acts of exploitation and plunder. Until very recently, however, the transgressions of multinational firms, if and when they occurred, had little if anything to do with what the international community called “human rights.” Nation-states or groups and individuals within them were violators – not the multinational corporation. What the Khmer Rouge did in Cambodia was very different than what Bhopal did in India or Shell did in Nigeria, so the argument went. In a word, the idea that a business enterprise had a responsibility to protect human rights outside of the laws of the nation-state it operated in – no matter how lax or poorly enforced – was unheard of in the Golden Age of globalization. The nation-state and the ideal of global capital markets free of government intervention are both products of Enlightenment, creatures of the same modern western liberal political thought that Fukuyama lionized in 1989. Ironically, however, they tend to work at cross-purposes. The nature of the multinational firm is to search the world over for profits, irrespective of territorial boundaries. The nature of the state is to covetously protect those boundaries. Firms operating globally do not necessarily want to be regulated globally, or even at all. But neither does the nation-state, since doing so would undermine state sovereignty. Inevitably, without intervention of some authoritative body, we have the political and economic equivalent to the Second Law of Thermodynamics: systems evolve toward a maximum state of entropy. The cacophony of international business practices, government policies, and political regimes may lead to international chaos when it comes to the rights of the individual in civil society – the very thing that the post-1989 New World Order was supposed to uphold and respect. It is into this vortex that then Secretary General Kofi Annan asked Kennedy School of Government Professor of International Relations John Gerard Ruggie to step. The year was 2005. Annan appointed Ruggie the UN Special Representative on the Issue of Human Rights and Transnational Corporations and other Business Enterprises. His charge was to devise a “road map” to address human rights abuses resulting from international business activity. For several years, progress on the issue had stalled out as international businesses, human rights NGOs, and sovereign states unsurprisingly butted heads over a unified approach. For the next six years, Ruggie – working part time and pro bono – held nearly fifty consultations on five continents, producing thousands of pages of reports. In 2011, against seemingly insurmountable odds, Ruggie and his stakeholder groups were able to get the UN Human Rights Council to unanimously endorse his “Guiding Principles” on business and human rights. 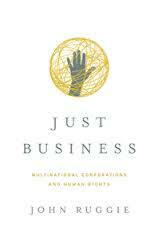 JUST BUSINESS: MULTINATIONAL CORPORATIONS AND HUMAN RIGHTS is the captivating story of how that happened. Adapting the international human rights regime to encompass business conduct runs smack into some of the most prominent features of the current world polity and economy: national sovereignty; competition among states for markets; investments, and access to resources; the emergence of new global powers with their own views about both business and human rights; weal or corrupt governments in many countries; the corporate-law principle of legal separation between parent companies and affiliates, asymmetries of capacity and influence between large companies and many governments; large swaths of conflict zones; few and highly contested bases of extraterritorial jurisdiction – the list goes on (pp.170-71). Given this daunting laundry list of obstacles to the successful implementation of a human rights regime for business practices, it might seem perfectly reasonable to respond by offering one overarching international law that binds businesses everywhere under a common set of human rights standards. In other words, launching an international treaty negotiation that would impose standards on firms or states, or both. The problem with that approach, according to Ruggie, was that, “the foundations for any treaty negotiations simply did not exist at that time, least of all for some comprehensive framework” (pp.56-7). In Chapter 2, Ruggie spends a good deal of time debunking this method, suggesting that it would have been naïve to think a treaty on human rights and multinationals could actually get ratified in a reasonable amount of time, if at all. On the contrary, Ruggie posits that going down that road would have set the agenda back rather than advancing it. Instead, his approach was to offer a normative methodological structure within which states and multinationals could operate – a “what” to follow for states and business enterprises, and a “how” to follow it (p.81). The “what” comes in the form of something Ruggie calls the Protect, Respect, and Remedy Framework. “Simply put, states must protect; companies must respect; and those who are harmed must have redress” (p.xxi). After more than a half-century of international human rights regimes, states are well aware of their duty to protect populations from abuses, but are far less familiar with how to protect them from abusive business activities. Ruggie proposed a set of policy clusters that focused on aspects like the international investment agreements states sign with firms as well as how states structure national corporate law and securities regulation. Second, within the Framework Ruggie proposed building on the corporate social responsibility (CSR) model to insist corporations respect human rights as a near-universally recognized social norm that exists “independently of a state's abilities or willingness to fulfill their own duties” (p.91). Finally, individuals who have been victims of a firm’s human rights abuses should have redress. Ruggie’s rules contend that the range of avenues must include judicial, administrative, legal and “other” means such as mediation by national human rights institutions or grievance [*466] mechanisms within the firm (pp.102-4). As for the “how,” Ruggie and his colleagues offered the GPs a detailed and complex roadmap for accomplishing the principles set out in the Framework. “The Guiding Principles constitute a normative platform and high-level policy prescriptions for strengthening the protection of human rights against corporate-related harm…[which provides] a foundation for expanding the international human rights regime to encompass not only countries and individuals but also companies” (p.124). While the GPs contain both “hard- and soft-law elements,” they are not an international treaty – and therefore offer no mandatory requirements on the part states or businesses. Rather, they provide “principled guidance” to states and business enterprises (p.126). Ruggie maintains that the Framework and the GPs take the international community beyond the “mandatory vs. voluntary” divide. Yet, the voluntary nature of the GPs is at the core of some of the harshest criticism Ruggie and the UN have endured. Indeed, despite the incredible work done by Ruggie and his stakeholders, the Council’s unanimous approval of the GPs in 2011 was not an indication of an international consensus on the matter. Shortly after the HRC endorsed the GPs, Human Rights Watch (HRW) put out a disparaging statement, saying, "In effect, the [Human Rights Council] endorsed the status quo: a world where companies are encouraged, but not obliged, to respect human rights"(Rosen 2013). In its 2013 Annual World Report two years later, published just months before the release of JUST BUSINESS, HRW did not relent. The title said it all – “Without Rules: A Failed Approach to Corporate Accountability.” The report’s author Christopher Albin-Lackey explained, “But while the Guiding Principles do mark progress in some areas, they also underscore the failures of the current approach to business and human rights issues ‒ one that is driven by weak government action and undue deference to the prerogatives of businesses”(Albin-Lackey 2013). HRW took aim at the voluntary nature of Ruggie’s GPs, arguing that “voluntary initiatives all face the same crucial limitations: they are only as strong as their corporate members choose to make them, and they don’t apply to companies that don’t want to join”(Albin-Lackey 2013). Governments need to find the courage to make respect for human rights by powerful corporations [*467] mandatory wherever they operate, rather than treating it as just a nice idea. Human rights activists should help design workable regulatory frameworks that are fair to companies. And businesses should welcome, rather than reject, efforts to provide them with the kind of rules and oversight they need to be responsible actors who respect the fundamental human rights of the people they impact (Albin-Lackey 2013). In his defense, Ruggie has pushed back on these and other criticisms, essentially arguing that the GP’s are the beginning, not an end, of a long and arduous process toward implementing a human rights regime for business activity. In response to the scathing HRW report, he has pointed to progress made since the Council’s endorsement of the GPs in 2011, citing no less than a dozen developments that are by-products of his work (Ruggie 2013). If the publication of JUST BUSINESS and the reactions it has garnered are any indication, it is safe to say that the debate over mandatory vs. voluntary approaches to how multinational corporations respect human rights will continue for the foreseeable future. The process changing the behavior of individuals and the institutions they are part of will always be slow and messy. Nonetheless, a few things should be clear from John Ruggie’s work and the story he conveys in JUST BUSINESS. The first is that, whatever one feels about the GPs and their impact, John Ruggie deserves a world of credit for what he was able to accomplish with a mandate resting on low expectations, few resources, and a chaotic environment within which to operate. Second, his work indicates that the international human rights community is finally catching up to the globalization juggernaut that began a quarter century ago. At the turn of the millennium, few multinational corporations would have admitted that they actually have human rights responsibilities. In viewing the transformation that Ruggie helped hasten, one is reminded of developments in different contexts, such as that of the legal regime which has developed around sexual harassment in American law and abroad. Before the early 70s, “sexual harassment” did not exist – though we know it happened all the time. Today there are rules and regulations and court decisions and penalties for violations. A right needs to be articulated and steeped in a coherent set of discursive practices in order to become real. Currently, although more and more firms seek to head off regulation by adopting so-called voluntary corporate social responsibility models, few of them would argue today that there is no such thing as human rights violations by business enterprises. Wherever this issue is heading, that recognition is a major victory. There is simply no turning back now. Finally, Ruggie’s story points to a much larger saga about the “universalization” of Western liberal democracies that Fukuyama had conceived at the beginning of this Era of Globalization. History tells us that the West won the Cold War, and that capitalist democracy won out over totalitarianism. Few would accuse Fukuyama of being so naïve as to assume that the “universalization” of liberal democracy would amount to the absolute evaporation of all conflict. However, what the “end of history” [*468] devotees perhaps could not foresee is the extent to which the two pillars of western liberalism – free markets and universal rights – would go to war with one another. Ultimately, this is the story told in JUST BUSINESS: a tale of fratricide. While neither Ruggie nor his detractors would ever answer this question in the affirmative, is it possible that over the last decade John Ruggie has done more to save capitalism from itself and western liberalism from the dustbin of history than anyone? Albin-Lackey, Christopher. 2013. “Without Rules: A Failed Approach to Corporate Accountability.”HUMAN RIGHTS WATCH. .
Fukuyama, Francis. 1989. “The End of History.” THE NATIONAL INTEREST. Summer: 16. Rosen, Jon. 2013. “Ruggie Rules Detail Corporate Behavior Abroad.” USA TODAY. April 7, 2013. Ruggie, John Gerard. 2013. “Progress in Corporate Accountability.” INSTITUTE FOR HUMAN RIGHTS AND BUSINESS. February 13, 2013. Copyright 2013 by the Author, Christopher Malone.